We are big fans of Mexican food. We typically have one Mexican type dish a week. These enchiladas were a nice change to our typical chicken enchiladas. I slow cooked the chicken with a packet of ranch seasoning and a batch of my homemade taco seasoning. The chicken was so juicy and packed full of amazing flavor. I topped the baked enchiladas with a creamy salsa ranch dressing. They tasted great! They were even good leftover for lunch the next day. I used the cooking liquid to make some easy Mexican rice to go with the enchiladas. This didn't disappoint! Place chicken, taco seasoning, ranch mix and chicken broth in 6-quart slow cooker. Cook on low 6 hours. Remove chicken from slow cooker and shred. Reserve liquid for rice. Divide chicken and cheese between tortillas. Roll up and place in a lightly greased 9x13-inch pan. Bake at 350 for 20 minutes. Combine Ranch dressing and salsa. Pour over baked enchiladas. Serve with rice. Heat oil in a large saucepan over medium heat and add rice. Cook, stirring constantly, until puffed and golden. Stir in onion flakes, tomato sauce and crockpot liquid; bring to a boil. Reduce heat to low, cover and simmer for 20 to 25 minutes. Fluff with a fork. I think these sound and look great. Love the slow cooking method with the two sauces. Pinned! What about the type of rice? Minute or not? I've never eaten an enchilada before. I should try this recipe. Thanks for sharing! Looks good, will be trying this tonight. The spices sound great with the chicken. In the southwest, enchiladas are usually made with corn tortillas, which have a very different texture/taste. I think this recipe will be a hit. I can't wait to try these! Great idea using the cooking liquid for the rice! 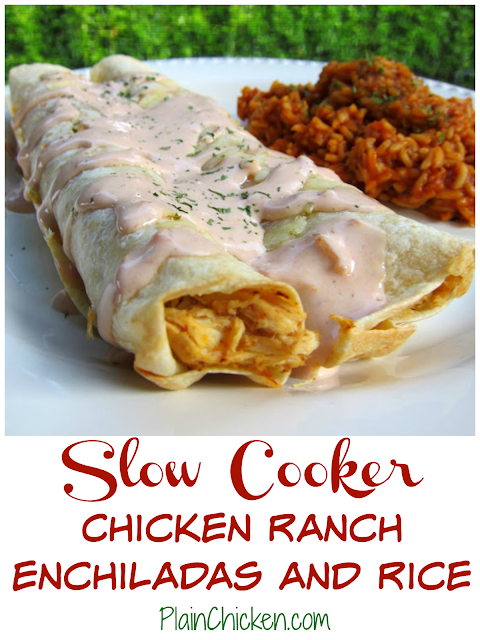 We make chicken almost the same way in the slow cooker and use it for enchiladas, quesadillas, tacos, and other Mexican dishes. We also use Italian seasonings and add it to past dishes! This looks fabulous, Steph. Enchiladas rock and I like this version. I really need to start commenting more on your blog - I pin a lot of recipes from your site for future use. Every single time we have a "Plain Chicken dish," it is a hit with my family and I ALWAYS end up printing them for my recipe binder. We had these last night - it was easy to put together, and I loved being able to make a side with it. We all LOVED them - very flavorful and tasty! I printed it to make again. Thanks for so many great dishes!!! Hi! I'm making this now and it smells so good! Question about the rice...do you precook it and then add to the oil? Thanks! Amanda - you don't precook the rice. You saute the uncooked rice in the oil and then add the liquid. what is "crockpot liquid"? Can I buy that at the grocery store? This was Sooo easy to make, and it was Sooo delicious!! How long to you keep the chicken in the crockpot for? These look so yummy!!! Going to make these tomorrow! Trust in Love Photography - I cooked the chicken about 6 hours. Do you think it would be okay with brown rice? This was great! Subbed a can of diced tomatoes for the tomato sauce in the rice. Still came out great! Husband loved it!